Last year as wave after wave of tropical fury visited our fair State, we all had to wonder what prompted such an irregular season. I honestly thought that Brevard would never see any real effects from a Hurricane, never mind several in rapid succession. Yes, I bought into the mythos, you’ve probably heard some of it. Stories tell that we built Kennedy Space Center where we did because no storm in recorded history had passed through the area or that native Indians said no hurricane would hit land there. So when Charlie, Frances, Jeanne and Ivan came through in 2004, we all looked for some greater meaning. The rumor in my email tells that high winds from Hurricane Charle tore away a previous sign on a billboard, revealing the previous one, visible for all to see. The following photo tells it all. How’s that for poignant? Many of us in Florida have seen these billboards and others in the campaign. There’s a great story behind them, but in relation to the 2004 storm season, this one really drives home the moral. We Need To Talk. The year 2004 marked a very polarizing year for our nation. Yet, hopefully, it opened up many peoples eyes to realities in the media, realities in political circles and truths that up until this point in time, we sensed, but not openly or widely known. Our unseasonal, seasonal weather, made our whole state pause as we considered the possibilitiy that we really are not in control. This sign adds an exclamation point to the notion. It seems that opponents of God in our schools, in civic arenas, in the courts were winning battle after battle. School prayer is banned, separation of church and state, the battle cry . And Alabama Chief Justice Roy Moore was removed from office because he wouldn’t remove a monument depicting the Ten Commandments. As the election cycle raged on, the institution of marriage was under siege and many municipalities from San Francisco to Boston proclaim gay marriages legal. As the hurricanes swept by, we all lost a sense of security and realised that we aren’t as bullet proff as we imagined. So many of us are still repairing or recovering from the weather, and the economic impacts the left. And yet, have we learned anything from 2004? Since then, we’ve watched Terry Schiavo die. We’ve witnessed a little girl taken from a Citrus County home, taken from us. We’ve seen other searches for other children, most ending in the unthinkable. It’s easy to say, it’s just the times. Our actions, or inactions are not the cause of any of this. But I content that we’ve been given fair warning… and we need to do something, and do it soon. Do storms happen arbitrarily? Is it nature re-adjusting herself, or is there some meaning behind these things? I think the message in this billboard, is timely. It’s certainly for you to decide what it means to you. For me, I have to pause and think. Rembering what it was like to weather the storms humbles me. How we pulled together after them gives me hope. And that’s the important part–learning from it, drawing strength, and seeing the light of a new day. In 1998, an anonymous donor contacted an advertising agency with an idea for a local billboard campaign that would create a spiritual climate and get people to think about a daily relationship with a loving and relevant God. 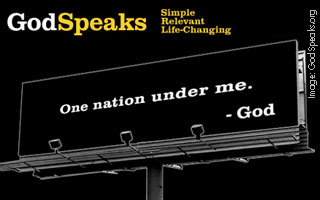 The agency came up with the idea of creating a series of quotes from God to be placed on billboards. The billboards would be simple and easy to read—black boards with white type, and all “signed” by God. No logo. No address or phone number. Not religious or condemning. Just straightforward messages that would rightly represent God. Eighteen sayings were selected to run on billboards in south Florida, ranging from serious to moving to funny; all intended to make the reader smile and think about God—perhaps in a new way. The campaign was scheduled to run for three months.